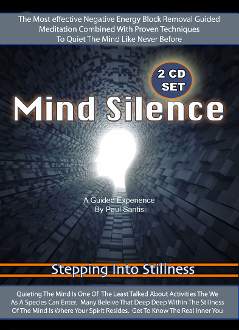 MIND SILENCE (stepping into stillness) Remove negative blocks automatically and quiet the mind as you enter a state of bliss and self awareness. This guided meditation takes you all the way, so you can see further than ever before from within. You will be positively re-charged and all of the negative blocks that you are holding you back will be released. The real you will be released and set free. You will feel the change manifest instantly upon listening. A very powerful guided meditation that will balance out your energy and then go deep within to clarify to the listener what is holding you back, energetically from achieving all your goals and dreams. Then these blocks will be acknowledged, confronted and replaced with pure positive intentions. Listened to by countless millions of people this is one of the most powerful audios ever created.